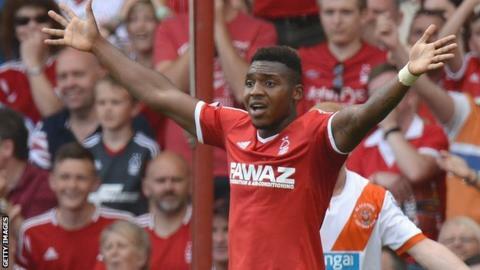 Britt Assombalonga is unlikely to miss part of Nottingham Forest's season to play in the Africa Cup of Nations, according to his manager Stuart Pearce. The 21-year old striker has the option to represent England or the Democratic Republic of Congo and has previously been invited to play for the latter. But Pearce told BBC Radio Nottingham: "At this moment I can't see him going away in January but who knows. "I think he said to Congo that he would prefer to keep his options open." Assombalonga, who has scored 12 goals in 19 starts this season since his summer move from Peterborough United, was born in DR Congo's capital Kinshasa, before moving to England before his first birthday. His father is a former Congolese international, and if he decided to play for the country of his birth in next month's competition, he could miss around three weeks of the English season in January and February. But Pearce said Assombalonga "wants to concentrate on his club career for now". "I think that is right and proper," Pearce added. "He is learning the game. "The choice is always his. I was very proud to represent my country so I would never influence a player to play or not play for their country. "That is purely a personal decision and we will support whatever decision he makes."